Download "Blue Pelican Geometry Theorem Proofs"
2 Table of contents Geometry Theorem Proofs The theorems listed here are but a few of the total in this curriculum. The vast majority are presented in the lessons themselves. 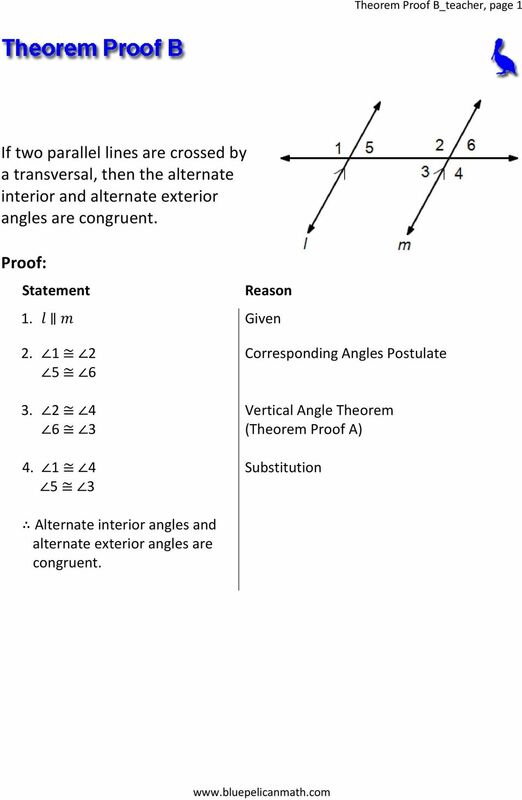 TP A: Prove that vertical angles are equal. TP B: Prove that when a transversal cuts two parallel lines, alternate interior and exterior angles are congruent. TP C: Prove that the sum of the interior angles of a triangle is 180 o. TP D: Prove that the base angles of an isosceles triangle are congruent. TP E: Prove that the line segment joining the midpoints of two sides of a triangle is parallel to the third side and that its length is half that of the third side. TP F: Prove that opposite angles of a parallelogram are congruent. TP G: Prove that opposite sides of a parallelogram are congruent. TP H: Prove that the diagonals of a parallelogram bisect each other TP I: Prove that a line parallel to one side of a triangle divides the other two sides proportionally. 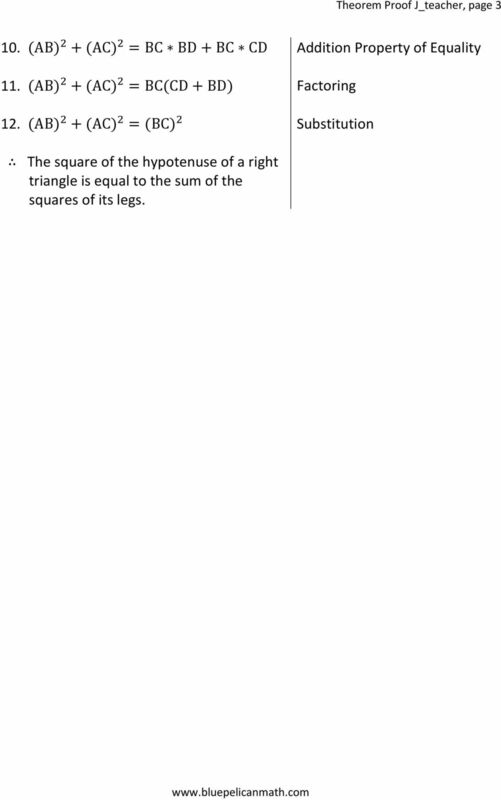 TP J: Prove the Pythagorean Theorem. TP K: Prove that all circles are similar. 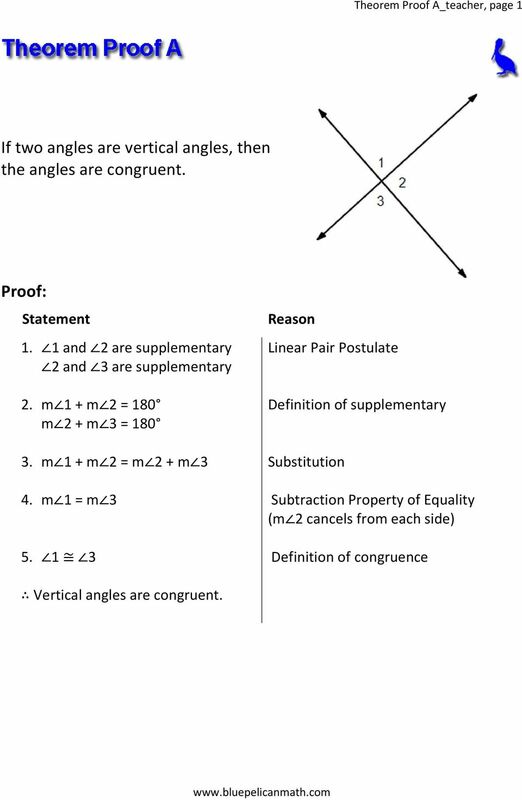 3 Theorem Proof A_teacher, page 1 If two angles are vertical angles, then the angles are congruent and 2 are supplementary 2 and 3 are supplementary 2. m 1 + m 2 = 180 m 2 + m 3 = m 1 + m 2 = m 2 + m 3 4. m 1 = m Linear Pair Postulate Definition of supplementary Substitution Subtraction Property of Equality (m 2 cancels from each side) Definition of congruence Vertical angles are congruent. 4 Theorem Proof B_teacher, page 1 If two parallel lines are crossed by a transversal, then the alternate interior and alternate exterior angles are congruent. 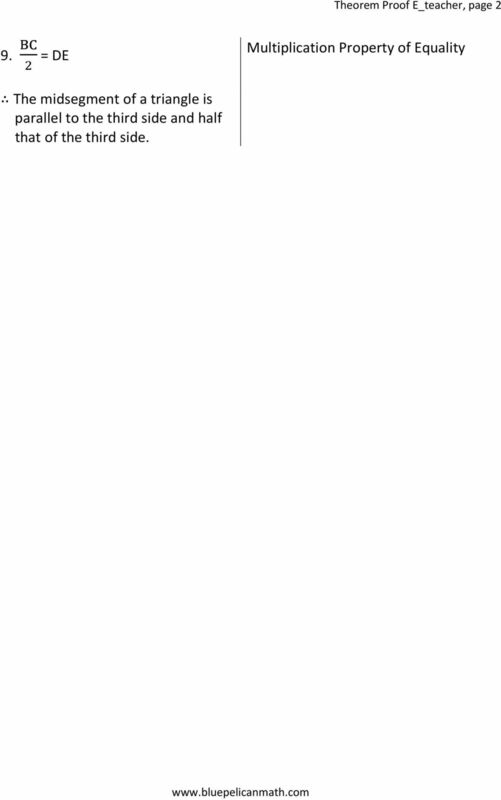 1. l m Given Corresponding Angles Postulate Vertical Angle Theorem (Theorem Proof A) Substitution Alternate interior angles and alternate exterior angles are congruent. 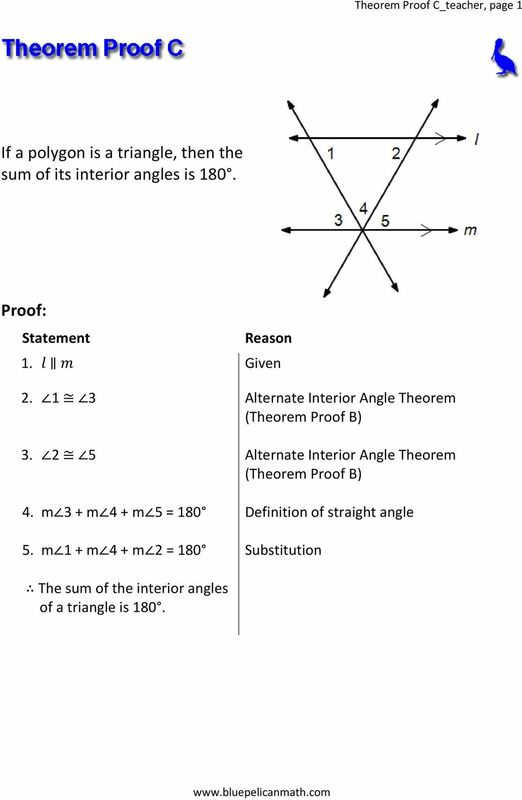 5 Theorem Proof C_teacher, page 1 If a polygon is a triangle, then the sum of its interior angles is l m Given Alternate Interior Angle Theorem (Theorem Proof B) Alternate Interior Angle Theorem (Theorem Proof B) 4. m 3 + m 4 + m 5 = 180 Definition of straight angle 5. m 1 + m 4 + m 2 = 180 Substitution The sum of the interior angles of a triangle is 180. 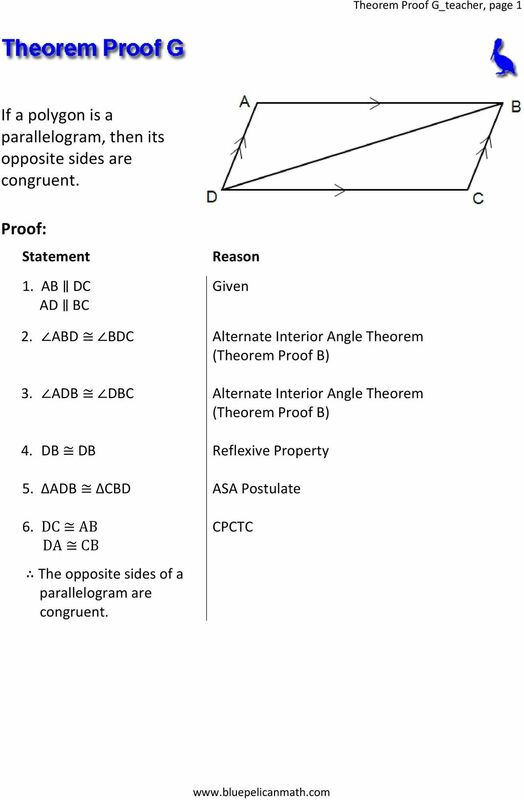 6 Theorem Proof D_teacher, page 1 If a triangle is an isosceles triangle, then its base angles are congruent. 1. AB AC AD is the angle bisector of BAC Given 2. BAD DAC Definition of angle bisector 3. DA DA Reflexive Property 4. ΔBAD ΔCAD SAS Postulate 5. 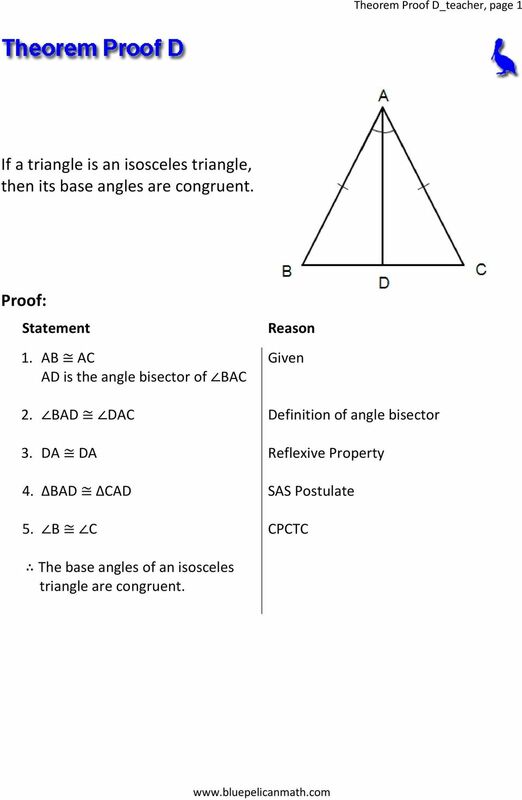 B C CPCTC The base angles of an isosceles triangle are congruent. 8 Theorem Proof E_teacher, page 2 9. BC 2 = DE Multiplication Property of Equality The midsegment of a triangle is parallel to the third side and half that of the third side. 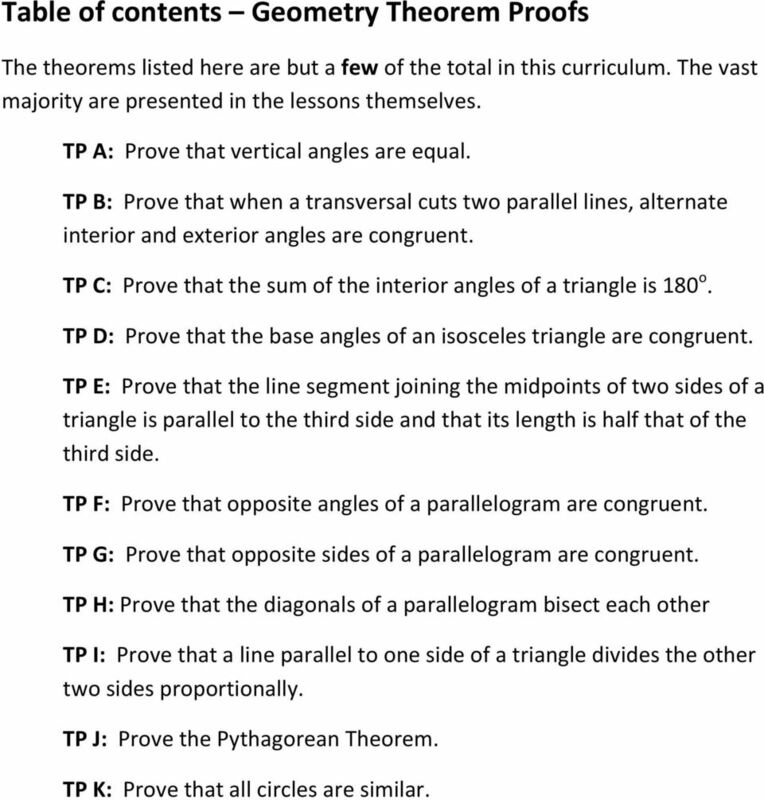 9 Theorem Proof F_teacher, page 1 If a polygon is a parallelogram, then its opposite angles are congruent. 1. 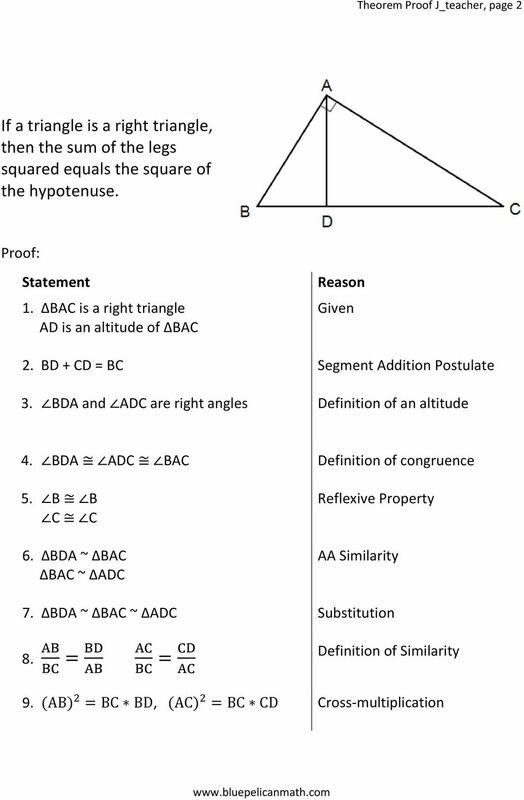 AB DC AD BC Given (ABCD is a parallelogram) 2. ABD BDC Alternate Interior Angle Theorem (Theorem Proof B) 3. ADB DBC Alternate Interior Angle Theorem (Theorem Proof B) 4. DB DB Reflexive Property 5. ΔADB ΔCBD ASA Postulate 6. 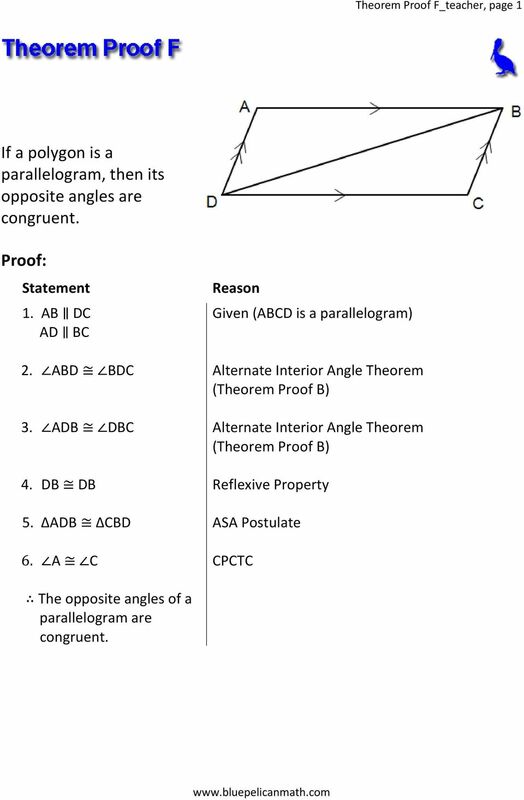 A C CPCTC The opposite angles of a parallelogram are congruent. 11 Theorem Proof H_teacher, page 1 If a polygon is a parallelogram, then its diagonals bisect each other. 1. AB DC AD BC Given 2. DAC ACB Alternate Interior Angle Theorem (Theorem Proof B) 3. 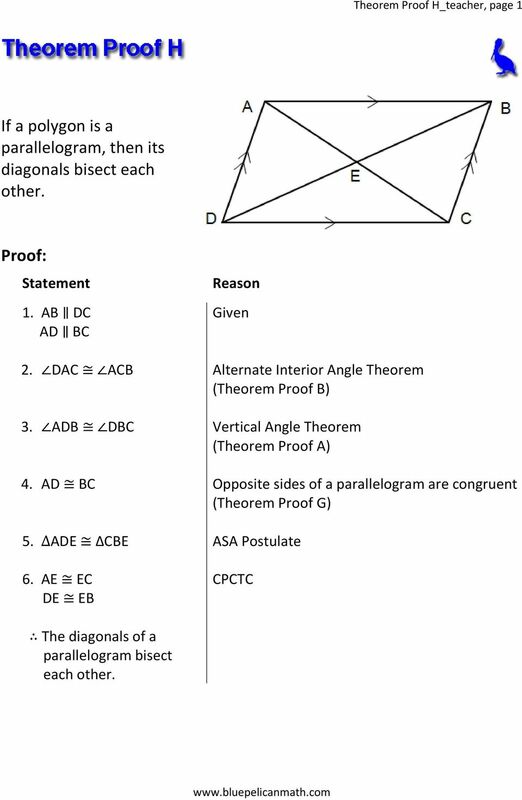 ADB DBC Vertical Angle Theorem (Theorem Proof A) 4. AD BC Opposite sides of a parallelogram are congruent (Theorem Proof G) 5. 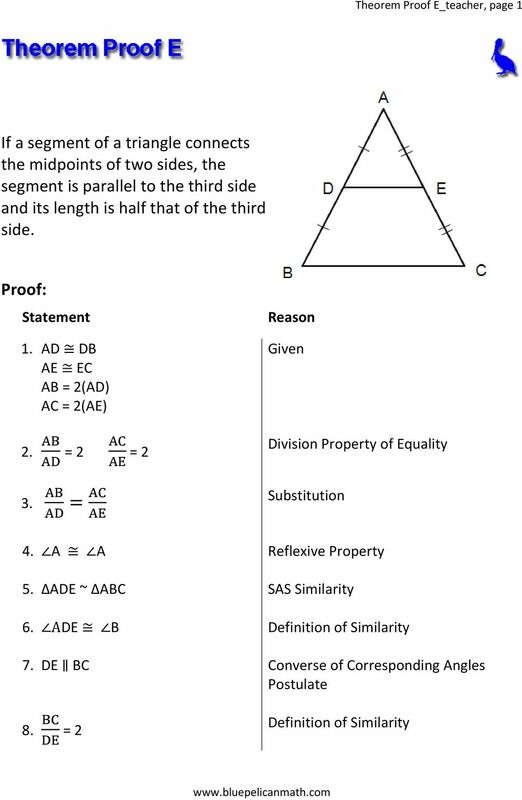 ΔADE ΔCBE ASA Postulate 6. AE EC DE EB CPCTC The diagonals of a parallelogram bisect each other. 12 Theorem Proof I_teacher, page 1 If a triangle contains a line parallel to one side, then that line divides the other two sides proportionally. 1. DE BC Given 2. ADE ABC Corresponding Angles Postulate 3. AED ACB Corresponding Angles Postulate 4. ΔADE ~ ΔABC AA Similarity 5. 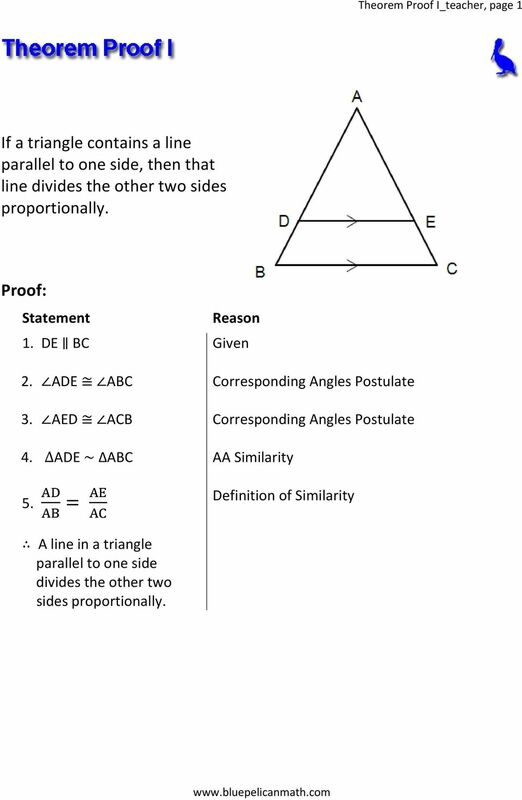 AD = AE AB AC Definition of Similarity A line in a triangle parallel to one side divides the other two sides proportionally. 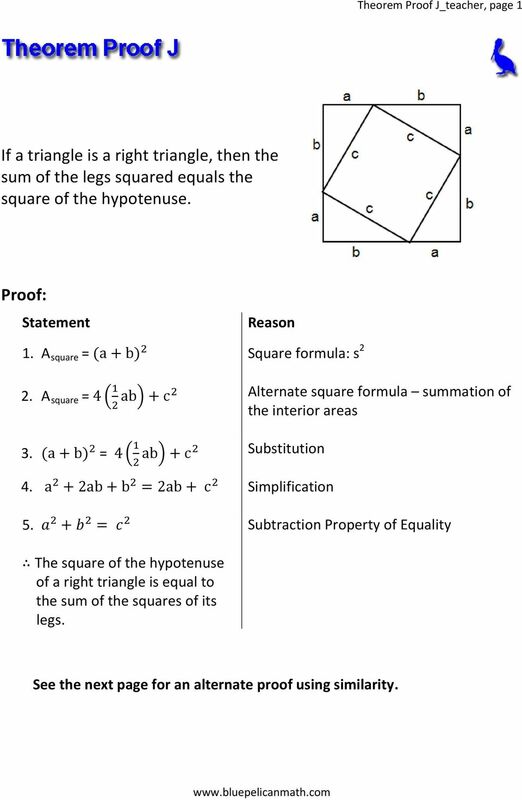 13 Theorem Proof J_teacher, page 1 If a triangle is a right triangle, then the sum of the legs squared equals the square of the hypotenuse. 1. A square = (a + b) 2 Square formula: s 2 2. A square = ab + c2 Alternate square formula summation of the interior areas 3. (a + b) 2 = ab + c2 Substitution 4. a 2 + 2ab + b 2 = 2ab + c 2 Simplification 5. a 2 + b 2 = c 2 Subtraction Property of Equality The square of the hypotenuse of a right triangle is equal to the sum of the squares of its legs. See the next page for an alternate proof using similarity. 15 Theorem Proof J_teacher, page (AB) 2 + (AC) 2 = BC BD + BC CD Addition Property of Equality 11. (AB) 2 + (AC) 2 = BC(CD + BD) Factoring 12. (AB) 2 + (AC) 2 = (BC) 2 Substitution The square of the hypotenuse of a right triangle is equal to the sum of the squares of its legs. 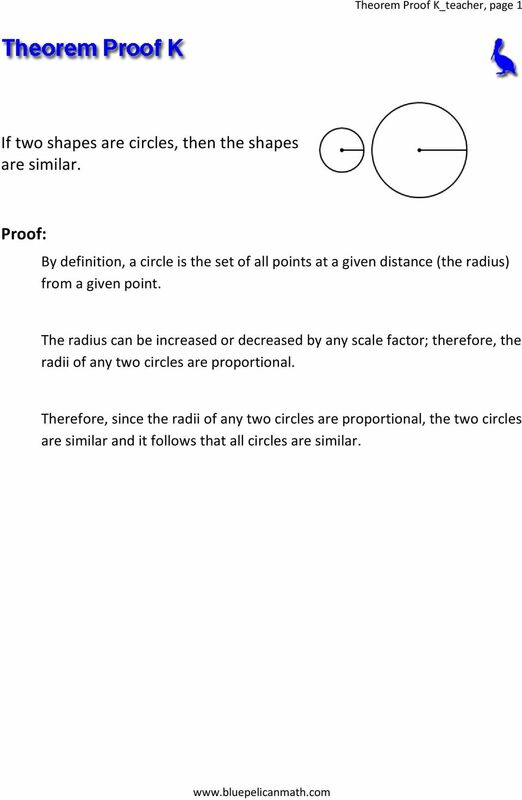 16 Theorem Proof K_teacher, page 1 If two shapes are circles, then the shapes are similar. By definition, a circle is the set of all points at a given distance (the radius) from a given point. The radius can be increased or decreased by any scale factor; therefore, the radii of any two circles are proportional. Therefore, since the radii of any two circles are proportional, the two circles are similar and it follows that all circles are similar. 1. Given: a b, b c a c Guidance: Draw a line which intersects with all three lines. 2. Given: a b, c a a. c b b. Given: d b d c 3. Given: a c, b d a. α = β b. Given: e and f bisect angles α and β respectively. Solutions to in-class problems College Geometry Spring 2016 Theorem 3.1.7. If l and m are two distinct, nonparallel lines, then there exists exactly one point P such that P lies on both l and m. Proof. Name: Class: Date: ID: A Geometry First Semester Final Exam Review Multiple Choice Identify the choice that best completes the statement or answers the question. 1. Find m 1 in the figure below. PQ parallel. 1. Find the length of BC in the following triangles. It will help to first find the length of the segment marked X.